A variety of wildlife can be found in the Sylvania Wilderness. Most noteworthy are the common loon with its haunting call and the majestic bald eagle because they are symbols of the northwoods and nature. Two other species, the white-tailed deer and the gray wolf, are noteworthy because aspects of their management are controversial. The exact number of deer in Upper Michigan’s presettlement forest is uncertain but may have been around 5-13 deer/mi2 (2-5 deer/km2). Deer density was limited by the small amount of food available in the dense forest where little sunlight reached the forest floor. Immigrant settlers moving into Michigan and Wisconsin in the early to mid 1800s reduced the deer population by changing the presettlement landscape and by intense hunting. Farming and logging degraded the deer’s habitat (although logging initially benefited deer in the dense forest of the north). The building of a railroad system that provided transportation of venison to eastern markets, intense subsistence hunting, and several fires further reduced their numbers. Deer were mostly gone from southern Michigan and southern Wisconsin by the late 1800s to early 1900s. Outrage at the slaughter as well as a growing tourism and sport hunting industry, which valued seeing live deer, resulted in a series of hunting regulations, such as prohibiting shipment of deer across state lines, the establishment of hunting seasons, and bag limits. Deer numbers began to increase as a result. Furthermore, the logged forest began to recover, some of the land cleared for farming was abandoned because of low soil fertility, and winters became milder. In 1935, deer density in the UP is estimated to have been about 27 deer/mi2 (10 deer/km2). More severe winters in the 1950s and 1960s resulted in a decrease in their numbers. A return to milder winters as well as an increase in corn acreage and supplemental deer feeding led to an increase to over 30 deer/mi2 (over 12 deer/km2) in the mid 1990s. Very snowy recent winters again decreased their numbers. Deer hunting is permitted in Sylvania. However, carcasses must be pulled out since no motorized or wheeled equipment may be used in the wilderness. This may discourage some hunters. Wolves were probably once present in all of Michigan’s counties. Years of predator control and bounties all but eliminated them from southern Michigan by 1910 and from the UP by 1960. In 1973, when no more than 6 animals lived in the UP, the federal government listed the gray wolf as endangered. Beginning in 1975, wolves from Minnesota began to migrate into northern Wisconsin and from there across the border into the UP. Estimated at 20 individuals in 1992, the wolf population grew to 520 in 2008. The federal government recently removed the gray wolf from the endangered species list. The most important factor in the comeback of the wolf has been the willingness of Michigan’s citizens to accept the wolf as part of our natural heritage. Their direct impact on the white-tailed deer herd is small. A healthy adult wolf takes about 20 deer per year. Most deer mortality is due to hunting and winter stress; only about 5 per cent is due to wolf kill. Deer are, however, good at avoiding predators. The common loon’s haunting cry, heard at great distances, is a distinct feature of undisturbed northwood lakes. Each spring, 8 to 10 pairs of loons arrive on Sylvania’s lakes and construct their nests. Their legs are positioned at the rear of the body, making them powerful swimmers but clumsy on land. The nests are therefore placed as close to the water as possible. Loon nests are usually found on the shores of secluded lakes or, for even greater protection, on islands. Landing on an island in Sylvania is therefore prohibited from “ice-off” to July 15 to allow for a successful loon fledging. Sylvania is also home to about 10 pairs of nesting bald eagles. The nests are easily spotted because of their size; they are the largest of any bird in North America. Bald eagles usually return to the same nest each year and add new material to it. Some of the bigger nests have been found to weigh more than a ton. 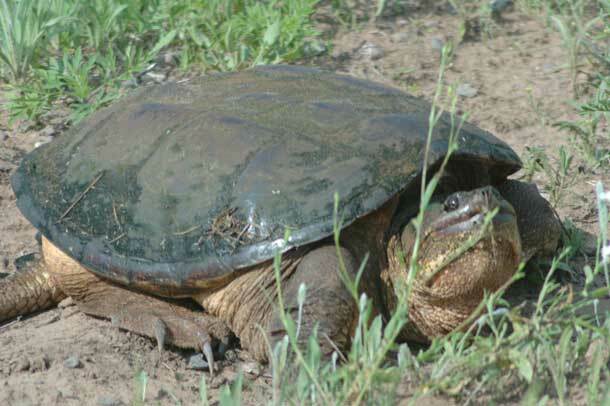 Other wildlife species commonly found in Sylvania include black bear, mink, snapping turtle, porcupine, osprey, great blue heron, barred owl, pileated woodpecker, merganser, and ruffed grouse. The Fish and Wildlife Service reports evidence of the presence of the now delisted gray wolf in Gogebic County. The threatened least bittern was detected during a recent Ottawa National Forest bird census. Everyone reports that the most common bird in early summer is the mosquito.